CARMEL, Calif. – August 13, 2018 – Artist Bruce Wheeler will debut an original sculpture of the 1906 Locomobile at the Automotive Fine Arts Society exhibit during the Pebble Beach Concours d’Elegance on Sunday, August 26th in Carmel, California. The Lincoln Motor Company will return for the 21st year as sponsor of the AFAS exhibit. 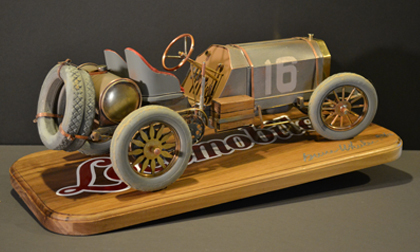 Wheeler’s sculpture depicts the legendary Locomobile, which won the first Vanderbilt Cup race in 1908. With representative cars from both the U.S. and Europe – and with the opinion that European marques were superior – the American-built Locomobile’s win upended perceptions while bringing the horse-drawn era to a close. Locomobile, established in 1899, would be out of business by 1929, concurrent with the Wall Street crash. However, its achievements would live on forever. Wheeler uses transportation subjects to effectively transport the viewer. Given the frequency with which he celebrates the dawn of the motorcar era, a viewer is taken to not only another time, but an almost parallel universe, when the automobile embodied all that was new in that new century. Wheeler’s work experience and education centered on design. In pursuing his art, Bruce explored the use of many materials and mediums. It was after developing his fabrication skills with jewelry and metals that he found it possible to craft automotive studies in metal. The end result is a modern representation of a vintage subject, one that seduces you into an emotional and mechanical vortex. A long-time member of AFAS, Bruce has received awards at the Pebble Beach Concours, Meadow Brook Hall Concours and Hickory Corners CCCA. His sculptures have been commissioned by patrons in the U.S., Europe, Canada, England, Japan and South America. AFAS was first established in 1983 by a group of artists who are acknowledged by critics to be among the best in their field. Members work in many diverse mediums including oil, watercolors, acrylics, wood, gouache, pen & ink, clay and metal. AFAS and its members participate in select shows across the country including the Pebble Beach Concours d’Elegance, Dana Point Concours d’Elegance and the Amelia Island Concours d’Elegance. Additional information about AFAS is available at www.autoartgallery.com.